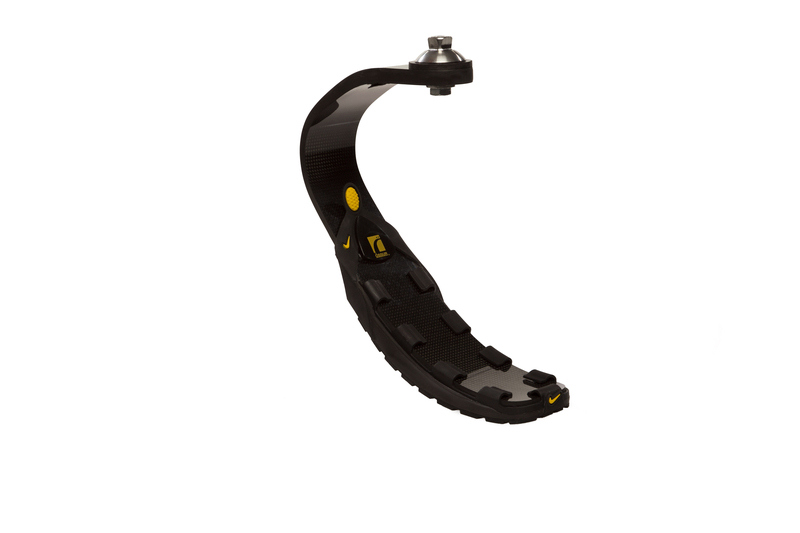 Nike is introducing a new sole utilizing state-of-the art design methods and technologies to create a lightweight, durable composite sole that can easily be used with Össur's Flex-Run prosthetic blade for amputee athletes. Not all competitive athletes have the privilege of competing without obstacles, so Nike has designed the new Nike Sole in conjunction with amputee triathlete and World Record Holder Sarah Reinertsen and Össur, a leader in the orthopedics industry known for their advanced prosthetic innovations. "The Sarah Sole project is a special one for Nike," said Tobie Hatfield, Nike Innovation Director. "The Nike Sole is a shining example of our passion and commitment to serve athletes and provide them the solutions they need to achieve their goals - we're always listening to the voice of every athlete." The Nike Sole features an integrated layered sole including an outsole, midsole and thermal plastic urethane called Aeroply, made of recycled Nike Air Bag units, serving as moderator between Nike Sole and the Össur Flex-Run's carbon fiber blade. Nine nylon plastic tabs serve as fingers that wrap snugly around the Flex-Run carbon fiber blade for secure lock down and easy on-off. A stretch rubber leash with tactile grip tab for easy placement over medallion fastener provides additional security. "The Össur Flex-Run enables amputees of all abilities to achieve their athletic goals," said Jon Sigurdsson, Össur's president and CEO. "This exciting collaboration has leveraged Össur's unmatched research and development in running prosthetics with Nike's first-class technologies, resulting in a product unlike any other." The first Nike prototype sole used by Reinertsen was made from a Nike Free 5.0 Trail outsole, which was adhered to a plastic-based sleeve that would slide onto the blade. Tobie Hatfield, Nike's Innovation Director, worked closely with Reinertsen to tweak the next round of prototypes based on her feedback wear testing the sole unit. Reinertsen, who faced the constant challenge of an unstable and unpredictable footwear solution, was born with proximal femoral focal deficiency. She had a bone-growth disorder which eventually led to her becoming an above-the-knee amputee at seven years old. Following the amputation she began to run track and broke the 100-meter world record for female above-the-knee amputees at the age of 13. Like most competitive amputee athletes, Reinertsen competes today in marathons and triathlons using an Össur Flex-Run prosthetic carbon fiber blade and Nike Sole. In 2006, she began working with Hatfield and the Nike Innovation Kitchen on a solution for her prosthetic outsole needs. Previously, Reinertsen would use the outsole of a traditional running shoe as her prosthetic "shoe." With limited innovations with prosthetic soles, this cobbling approach to creating solutions using regular running footwear had become the norm. The new Flex-Run with Nike Sole provides a reliable advantage and is now available through prosthetists' offices globally. Reinertsen's career success includes seven marathons (NYC 1997, 1998; LA 1998, 1999; Millennium New Zealand 2000; London 2002; and Boston 2004) and she was the first female above the knee amputee to complete the Ironman® World Championship in Hawaii in 2005. She's hungry for more success. NIKE, Inc. based near Beaverton, Oregon, is the world's leading designer, marketer and distributor of authentic athletic footwear, apparel, equipment and accessories for a wide variety of sports and fitness activities. Wholly- owned Nike subsidiaries include Cole Haan, which designs, markets and distributes luxury shoes, handbags, accessories and coats; Converse Inc., which designs, markets and distributes athletic footwear, apparel and accessories; Hurley International LLC, which designs, markets and distributes action sports and youth lifestyle footwear, apparel and accessories; and Umbro Ltd., a leading United Kingdom-based global football (soccer) brand. For more information, visit www.nikeinc.com.